Two of my friends came to springs from Texas last weekend. 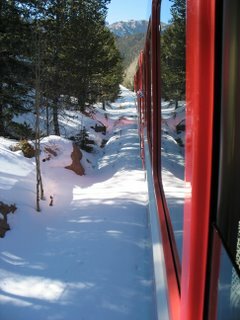 On Saturday we took the cog railway to Pikes Peak summit. Pikes Peak is the worlds second most visited peak after Mount Fuji in Japan. 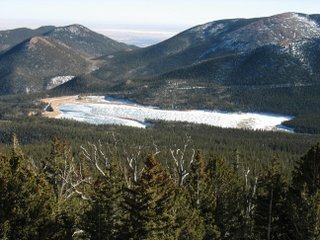 I had fallen in love with this mountain the day I first saw it when I arrived at Colorado Springs, two years ago. The view of the mountains from my apartment complex always wanted me to go there. And the trip wasn’t a long wait. A week after I arrived, my sister came down from LA to see me; that was when I first drove all the way to the summit. The view at every height was awesome. We also had a halfway trip when my boss from India arrived. We could not go to the summit due to snow. The day I got to know that people hike up the mountain on 13 mile long Barr trail, I was all excited and wanted to climb the 14,110 Ft high Mountain. And in 2005, a month before leaving USA, I fulfilled that desire too. Four of us hiked the peak; it was a total new experience which I might publish some other time. We took 14 hours to reach the peak, which is a little more than expected due to some not so nice experiences on the way. I do have the post ready and will post it soon. 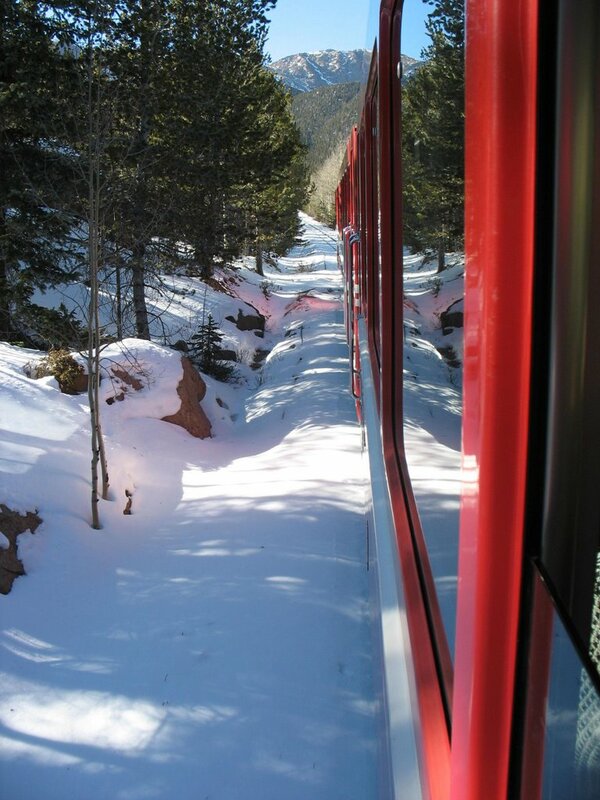 So the only other way left to reach the peak that I had not taken was Cog railway. So we took it this time. 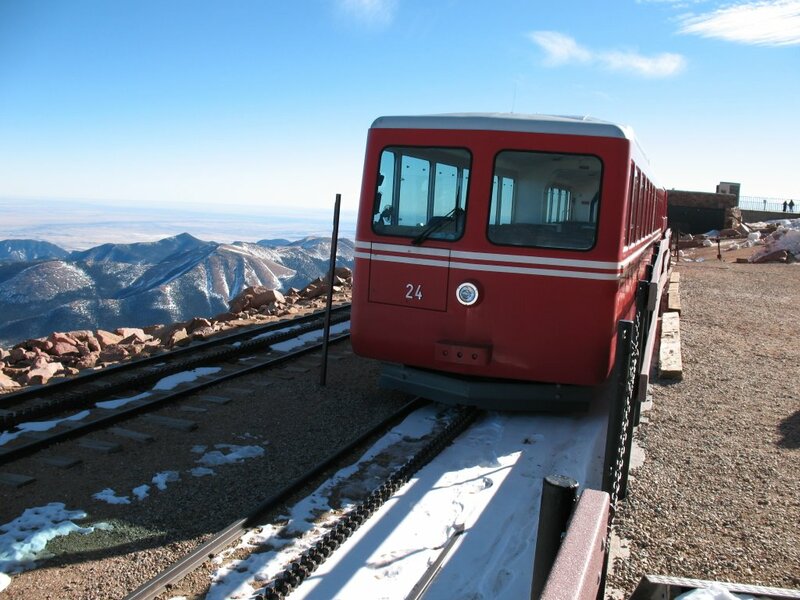 It was a very nice ride all the way to the summit on cog railway, as it makes it way twisting and turning through the mountain. Beautiful sights, wonderful landscapes and views enriched this journey. Later we stopped by the Garden of Gods, Balanced rock and few more red rocks stand brilliantly beneath the peak. I often used to drive there in the night, sometimes alone. The view of the city from there is just amazing ecspecailly as night falls. That evening, we had been invited to a colleague’s house for an “open house”. She and her husband are totally involved in the archeological surveys, trips to canyons, and sites of remains with Indian rock art. And they had displayed their and a friends photographs and paintings for sale. We enjoyed talking to them, listening to the stories of every picture, that obviously was very special to them and they had memories attached to it. I was inspired by their interest, their hobby, their work during free time. I want to grow old physically but not mentally, I thought. The enthusiasm in this couple touched me. I had been going to the seminars at their archeology group since I was here last time and I truly enjoy their spirits. Sunday, we watched a very bad Indian film in Denver called- Babul. Please don’t watch it if you haven’t. This is not the time for movies on widow marriages and that too made so boringly, I think these topics had long been touched and remade. “Choker Bali” though deals with the same theme but of different era, is brilliantly made movie which highlights clearly the desires and emotions and jealousy of a young widow, performed brilliantly by Aish. 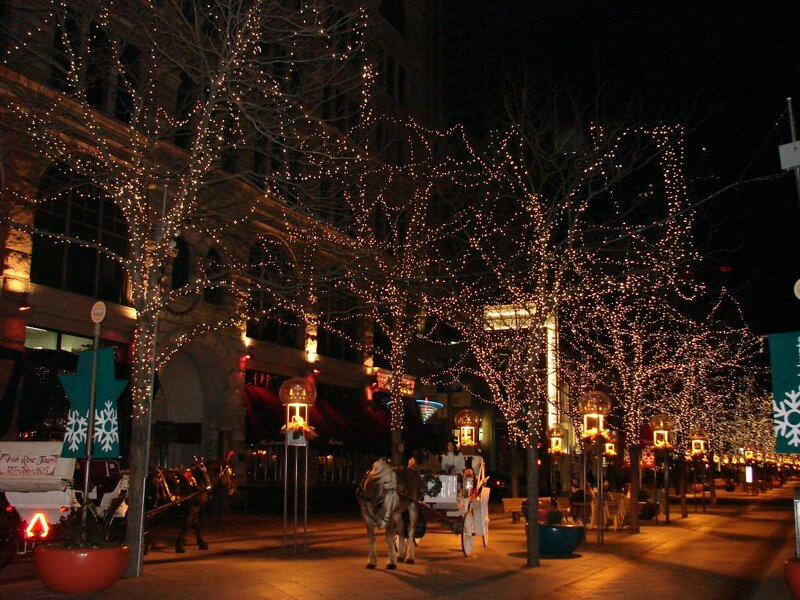 So after that boring movie, we went to Denver downtown, we took a walk on the 16th street. I recalled my memories of being there on New Years Eve of 2005. How crowded it was; people dancing on the street, enjoying the last few hours of the year and then the moment celebrated with grand firework. And today, it was empty, but yet with glimpses of that same enthusiasm; some with the lighting; some within me and my memories. After a walk we had dinner at an Indian restaurant and returned back home. My friends left to Texas this morning. Like every other day, this day has begun with a new life for me. Every day a new beginning, a new lesson that brings me closer and closer to the ultimate truth. Well I am back to my Philosophical statements that make less sense when read. But this has been a day of hurried emotions of various types for various reasons. I miss being myself. But the countdown has begun – 5 days to go. I need to break free from this pool of emotions and going back to Bangalore, looks the only probable solution. I love to be lost in the crowd once in a while. I love to disappear from everything I know at least for a while. I love to break free from bonds at least for a while. After all everybody needs their share of loneliness. Not the sad one but the self exploration kind. Have a safe trip back. Wish you could have come our way while you are here:) maybe next time? @Travel Plaza - Thanks. Sure may be I will do a trip to that part of the country sometime. Too bad, I read this post before and came looking for a new one, but wonder why I did not comment before. So are you back in India now? nice post.. travel safe!!! smack! @Bharat- Thanks. Well it was not a nice flight back....but inspite of the looooooong wait and delay , i must say, i enjoyed every bit of the excitment of traveling back home! hey, i have been there. yeah, it was really fun. so, you back in USA??? or you left left it? Had been there on an assignment for 2 months this time. Now I am back home, back in India. Good to hear that you went back to India for Christmas/New Years. Looking fwd to your update posts! Ajeya, travel liberates, only to enslave.